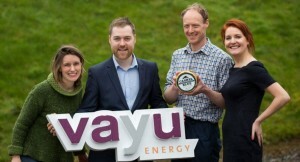 Irish energy supplier Vayu Energy has signed a renewable electricity deal with Cashel Farmhouse Cheesemakers, one of Ireland’s most successful producers of handmade cheeses. 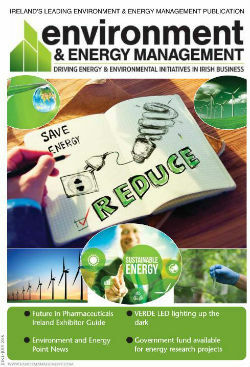 Valued at €130,000, the agreement will see Vayu Energy supply the family-owned business with 100% green electricity to meet its year-round energy requirements as it continues to expand both at home in Ireland and overseas. Established in 1984, Cashel Farmhouse is famous for the outstanding quality of cheeses it produces from grass-fed milk at its 200 acre farm in Beechmount, Co. Tipperary. Renowned brands include Cashel Blue, Ireland’s first blue cheese, and Crozier Blue, Ireland’s only blue cheese made from sheep’s milk. Each year, the farm produces over 300 tonnes of cheese with about 45% destined for the export market. Key overseas markets include Britain, the US, Australia, New Zealand and France – where Cashel Blue recently won the prestigious Super Gold medal at the Mondial du Fromage in Tours. The deal provides Cashel Farmhouse with direct access to wholesale electricity prices normally only available to larger energy users, allowing the company to achieve significant savings compared with traditional fixed rate tariffs in the market. As part of a fully managed agreement, Vayu will provide Cashel Farmhouse with the procurement tools and advice to purchase energy at the best price available in the market. 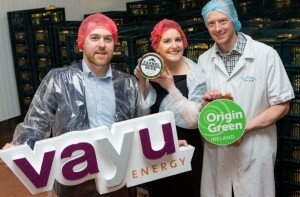 As a member of Bord Bia’s Origin Green sustainability programme, the ability to source 100% green electricity was a critical consideration for Cashel Farmhouse in choosing Vayu as its energy partner, thereby helping to significantly reduce the company’s carbon footprint and minimise its impact on the environment. Core elements of the farm’s environmental management programme include initiatives to minimise waste, recycle water, conserve natural resources and increase energy efficiency. In 2015, Cashel Farmhouse Cheesemakers installed 180 photovoltaic cells which will allow them to save up to 20% of their energy demand over the next 10 years. The company also dedicates 20% of its farmland to biodiversity, creating nature corridors throughout the farm for wildlife to flourish.